In spite of the affordability, convenience, safety, and effectiveness of heartworm preventives today, every year thousands of dogs and cats across the country are diagnosed with heartworm disease (HWD). Meanwhile, veterinary practices have reported no significant drop in the incidence of heartworm disease over the past several years. 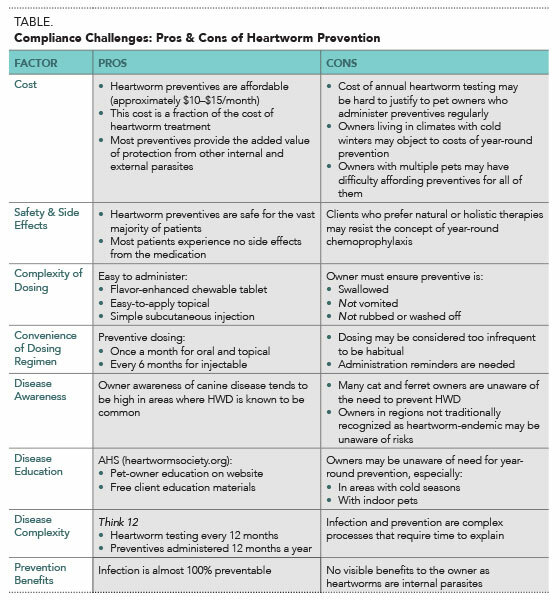 Given the availability of preventives with a very high degree of efficacy, the persistence of heartworm infections can be attributed to two factors: (1) lack of recommendation (not all clients are given a veterinary recommendation for heartworm prevention); and (2) compliance (not all clients follow recommendations given by veterinarians to administer heartworm preventives). This article will focus on the latter factor—the challenge of achieving client compliance with veterinary recommendations for heartworm prevention. 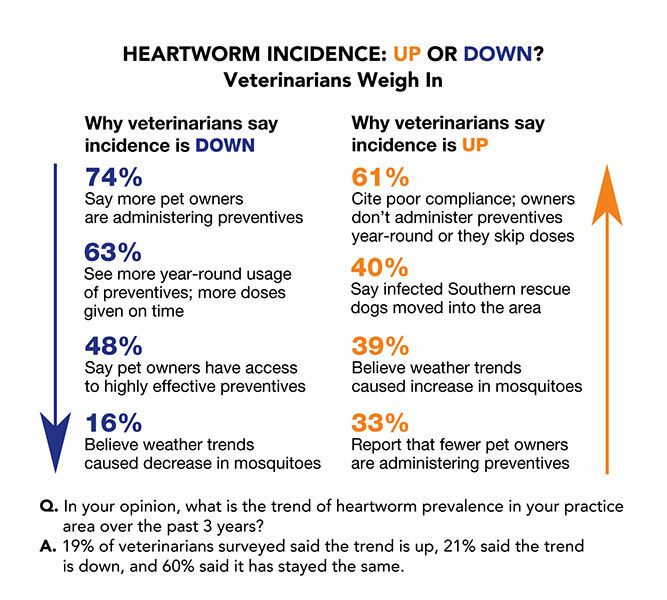 For more information on the 2013 AHS survey, read Key Findings from the 2013 American Heartworm Society Survey, published in the July/August 2014 issue of Today’s Veterinary Practice and available at tvpjournal.com. Compliance is defined as the consistency or accuracy with which someone follows the regimen prescribed by a physician or other medical professional.2 Terms such as adherence, which is defined as attachment or commitment to a person, cause, or belief, have also been used to describe this behavior. Ensuring medication is not vomited or otherwise removed from or by the pet. The fact that lack of compliance persists as a problem in heartworm prevention is not due to a lack of options in preventives. The first canine heartworm preventive medication, which contained diethylcarbamazine, was approved by the U.S. Food and Drug Administration (FDA) for daily administration in 1977. The first monthly preventive, which contained ivermectin, was launched in 1987 and ushered in an era when heartworm prevention would become convenient as well as more affordable. Today U.S. practitioners can choose from a number of monthly oral and topical medications for dogs and cats, as well as a semi-annual injectable preventive for dogs. Furthermore, monthly heartworm preventives offer the added value of addressing multiple internal and external parasites. Understanding the factors involved in compliance is the key to addressing lack of compliance (Table). Compliance rates for heartworm prevention are not precisely known. Part of the difficulty in evaluating compliance is due to the fact that clients cannot be compliant if their veterinarians do not recommend use of heartworm preventives. In a survey of more than 4000 veterinarians conducted in early 2014 by the AHS,1 72.4% indicated they follow the AHS guidelines for prevention, diagnosis, and treatment of HWD. Because the guidelines recommend year-round prevention in all dogs and cats, it is reasonable to assume that a majority of veterinarians are recommending heartworm prevention to at least some of their clients. 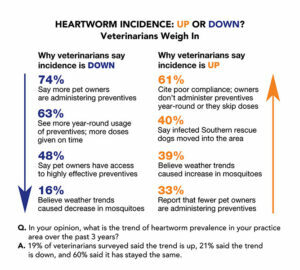 In the same survey, 13.4% of veterinarians surveyed said they “never” see heartworm-positive dogs, thus, suggesting—but not proving—that routine heartworm prevention may possibly not be part of their practice recommendations. Meanwhile, compliance studies with both human and animal health medications lend insights to an understanding of heartworm compliance (see also Strategies for Compliance Success). Like my clients, I am a pet owner. And like them, I need to remember to give my own pets’ heartworm preventives on time. Showing my clients I understand the challenges they face, while also sharing how I personally remind myself to protect my pets, is a compelling way to inspire clients to do the same. I explain to my clients that I use the stickers provided with the heartworm preventive and put them on my calendar, placing the stickers on the first day of each month. When I administer the heartworm preventive to my own cats and dogs, I take a marker and cross through the month’s sticker to show the medication has been given. As I turn over each month’s new page, I see the reminder I need. Some clients like this approach; others prefer a different kind of reminder. For those clients, I recommend remindmypet.com for email or text message reminders. 81% and 83% of dogs, respectively, in the Rocky Mountain and Pacific northwest regions. Meanwhile, a 2014 survey conducted by AAHA found that veterinary visits are declining in frequency, with owners extending the time between visits. In 2009, dog owners averaged 11.5 months between veterinary visits; that number grew to 16.9 months by 2014.5 Such declines do not bode well for annual heartworm testing or timely heartworm preventive prescription renewal. Estimates from national organizations are helpful in understanding compliance trends, but the data that matter most to veterinarians in practice are those from their own clients. Individual veterinarians may not be able to change the overall trajectory of HWD, but they can address compliance in their own practices. Tracking purchase history is a reliable means of determining a pet owner’s compliance, especially when paired with client dialogue. In my own practice, before I walk into the examination room, a staff member has handed me the data on the client’s heartworm prevention purchases. This helps facilitate a truthful and productive discussion with the client and also serves as a good reminder to discuss heartworm prevention with the client. When considering HWD, the effects of heartworm preventive noncompliance are clear: in dogs, cats, and even ferrets, the risk of developing HWD, which can be fatal, is greatly increased, and in the case of cats and ferrets, there are no approved medications for treatment of HWD. An additional downside to preventive noncompliance is the cost differential between prevention and treatment, should the pet contract heartworms.6 Not only is the annual cost of prevention typically less than 10% of the cost of heartworm treatment, but damage from HWD is often permanent, even when treatment is administered. Furthermore, treatment often produces painful inflammation at the injection site, it is far from perfect in its efficacy, and eliminating heartworms can, and does, worsen pulmonary disease associated with heartworm infection. If these factors are applied to the scenario of veterinary clients and heartworm compliance, it is clear that similar principles are in play. Many practitioners believe the biggest obstacle is not the cost of preventives; rather, the culprit is the owner’s perception regarding the need for prevention. Clients whose pets are not on heartworm preventives often don’t understand the need and the urgency for heartworm prevention. Some pet owners state they have indoor pets or perceive they don’t have a mosquito problem where they live. Clients may once have been compliant with prevention but over time have become lax without immediate consequences. Whatever the reason, the result is that far too many pets go unprotected. Visit tvpjournal.com to view these articles. Education is a lifelong process for the pet owner. Veterinarians cannot assume that an owner remembers a heartworm prevention discussion—and is still in agreement—because it was discussed at the pet’s initial visit, but never thereafter. At my hospital in Mobile, Alabama, we talk about heartworm prevention at every visit. If compliance is up to par, our staff can pat the owner on the back and encourage them to keep up the good work. If compliance is poor, we know we need to discuss again the risks of HWD, as well as the cost/benefit of prevention versus treatment. As part of this discussion, it is also important to explain how heartworm preventives work. Oral heartworm preventives, for instance, only remain in the pet’s body for about 3 days, during that time preventing larvae from maturing into young adults. The window of heartworm larval susceptibility is approximately 30 days, so it is apparent why skipping or delaying a dose can put the pet at risk of infection. Another factor in human compliance is the quality of communication and level of trust between the medical professional and the patient.6 Extrapolating this to heartworm preventive compliance, it is an important reminder that how the veterinarian talks about HWD with clients is as important as what he says. Make eye contact with clients when you talk to them, and show empathy for both pets and their owners. Be empathetic to owners for whom heartworm preventive is marginally affordable or those who have a number of pets and are forced to make compromises. Staff members are vital to good client communication and relationships, and a unified message coming from all staff members is essential. Consider whether a culture change is needed in your practice. Does each member of the team keep his or her own pets on year-round heartworm prevention? There’s no more compelling message than when a staff members can say, “Here’s what I do for my pet.” Conversely, if staff members don’t practice what they preach, they will quickly lose the high ground. In my practice, new staff members attend weekly training meetings and shadow experienced members to ensure they understand the clinic’s protocols as well as how to discuss them with clients. You can also ask staff members to create a reminder system. When dispensing heartworm medication, set up an automatic reminder to refill one month prior to the expected expiration of the prescription. Avoid the term “monthly” when referring to heartworm preventives. Instead, use the phrase “every 30 days” to avoid confusion as to the dosing frequency.7 Linking the heartworm administration to another monthly task, such as the rent check, may be helpful. While HWD can be a complex disease to explain, the simple act of administering on-time heartworm preventives can help ensure a lifetime of patient health. Understanding what unique factors may stand in the way of individual clients performing this act is key to improving compliance (Table). Jones S. Key findings from the 2013 American Heartworm Society survey. Today Vet Pract 2014; 4(4):69-71. AAHA. 2009 AAHA compliance follow-up study. In Albers J, Hardesty C (eds): Compliance: Taking Quality Care to the Next Level. Lakewood, CO: AAHA, 2009, pp 1-17. Data on file, 2015. Merial, Inc., Duluth, GA.HGD15TRTECHDETAILER (03/15). Partners for Healthy Pets: AAHA-AVMA. Reversing the Decline in Veterinary Care Utilization: Progress Made, Challenges Remain. Available at partnersforhealthypets.org/Uploads/iv4kcp3e.juc/VetCareUsageStudy_WhitePaper_July2014.pdf. Jin J, Sklar GE, Oh VMS, Li SC. Factors affecting therapeutic compliance: A review from the patient’s perspective. Ther Clin Risk Manag 2008; 4(1):269-286. Merola V, Eubig P. Toxicology of avermectins and milbemycins (macrocyclic lactones) and the role of P glycoprotein in dogs and cats. Vet Clin North Am Small Anim Prac 2012; Mar 42(2):313-333; available at http://www.ncbi.nlm.nih.gov/pmc/articles/PMC4152460. Christopher Rehm, DVM, a member of the American Heartworm Society board of directors, received his DVM from Auburn College of Veterinary Medicine. He began practicing in Mobile, Alabama, more than 30 years ago. What began as one veterinary clinic, Rehm Animal Hospital, PC, has grown to 4 American Animal Hospital Association (AAHA) certified hospitals in 2 counties in lower Alabama. Rehm Animal Clinic has won numerous “best clinic” and “reader’s choice” awards from local newspapers. In addition to practicing veterinary medicine, Dr. Rehm has written a syndicated pet column, hosted live public service spots, and served as a speaker at veterinary meetings.